I am, like most people, always looking for a better position in the job world and today, knowing I have an important interview, well as important as the man can ever make it to me, got myself a nice shave and a haircut at my locally,(and amazingly great) barbershop near me. 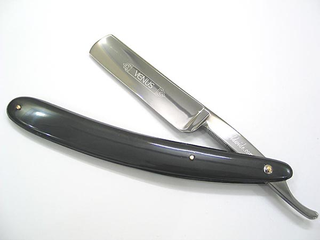 I have had a straight shave before, and my Sicilian/Irish nature leaves me with a 5'oclock shadow after every shave, so I thought I would get a hot towel and TREAT MYSELF to a wonderful straight razor shave. Amazing Balls. Best thing ever. I feel like I shouldn't shave for a few weeks right now, and am actually waiting for the lady to get home and be pleased with the surface. I know these kinds of small details don't get ya the job ya want, but there definitly is something to say about fixing yourself up from a confidence standpoint.